Our canvas toiletry bag is designed for the busy traveler to pack all their toiletries and travel essentials, while traveling in style. One External & One Internal Zipper Pocket: Keep and arrange your travel essentials the way you like. For the busy professional: A Grooming Bag for your shaving kit, facial wash, hair gel that keeps you prim and proper. For the tech founder: A Tech Dopp Kit for your laptop charger, travel adapter, cables, portable power that keeps you online wherever you are. For the outdoor adventurer: A Heavy Duty Travel Bag that keeps your dried foods, fruit bars and energy drinks fresh while you trek the harsh mountainous terrain. For the busy mommy: A Cosmetic Bag for your makeup kit, facial moisturizer, vitamin bottles, and even your hairdryer. For the fitness enthusiast: A Gym Bag for your towel, protein shake, bath and shampoo bottles that keeps you clean while gaining strength. 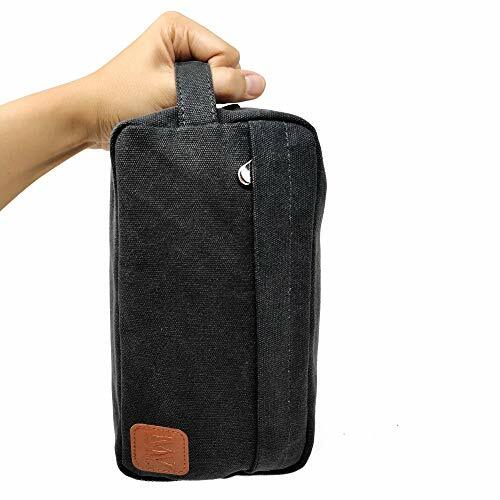 For anyone who wants a travel toiletry bag to keep their essentials everywhere they go. We want all our customers to be satisfied and happy! If our product is not to your liking, just return it and you get your money refunded in FULL, unconditionally.